As a function of population growth we can only expect future energy demand to increase, and with it the demand for oil and other natural resources. 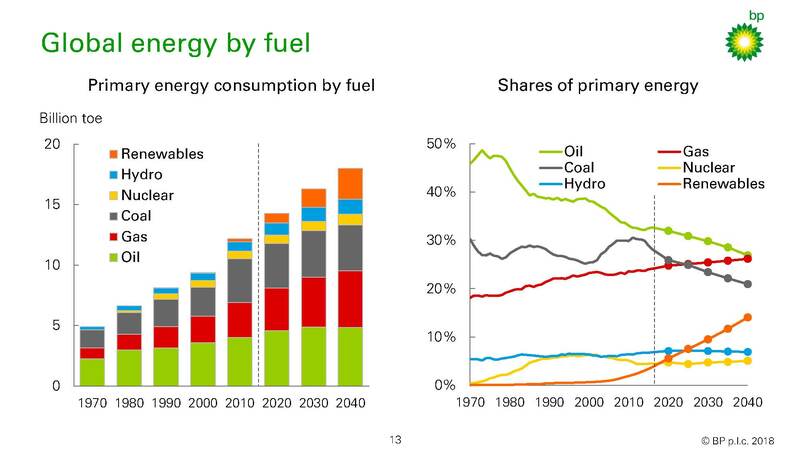 Global energy by fuel, primary consumption and shares. Pages from the BP Energy Outlook 2018. ©BP p.l.c. 2018. 2040: that is only 22 years from now (remember 1996?). BP is once again looking into the crystal ball, all the way up to 2040, with the results presented in their most recent Energy Outlook (2018 edition)*. A prerequisite to understanding future energy demand is GDP (Gross Domestic Product) forecasts as a function of population growth. According to BP, world GDP will more than double during the next two decades, broadly in line with growth seen over the past 25 years. And, as the global population reaches 9.2 billion, more than 2.5 billion (500 times Norway’s population!) will be lifted from low incomes. BP therefore concludes that global energy demand will increase by about 35% as global prosperity increases. China and India will account for half of this demand. That figure is not controversial. Forecasting the future energy mix is, however, always controversial. BP’s view is that oil, gas, coal and non-fossil fuels (hydro, nuclear, renewables) will each contribute around 25% in 2040. Renewables will constitute 14% in 2020, with an annual growth of 7%. This makes up 40% of the increase in energy supplies. Remember, with an annual growth of 7%, it takes ten years to double the production. Consequently, the world needs a much stronger growth in renewables if these sources are to replace fossil energy before 2040. For the oil industry, it is comforting to read that BP believes that demand for oil will grow by 0.5% p.a. during the 2020s. However, demand is projected to plateau in the 2030s. Moreover, demand for natural gas will grow strongly at 1.6% p.a. and during the next 20 years it will overtake coal as the second largest source of energy. The world is likely to demand large quantities of oil for many decades to come, BP concludes. Found this article interesting? Check out the full BP Energy Outlook 2018 for the full story. Halfdan obtained a M.Sc. in Geology from the University of Oslo and then worked for Saga Petroleim for five years including a year in the US. He also worked for Nopec and PGS, before becoming Founding Editor of GEO ExPro Magazine. He is Editor of the Norwegian geological magazine GEO.